Drs. Gatzoulis, Webb, and Daubeney lead a team of experts ideally positioned to provide state-of-the-art global coverage of this increasingly important topic. Each disease-oriented chapter is written to a highly structured template and provides key information on incidence, genetics, morphology, presentation, investigation and imaging, and treatment and intervention. 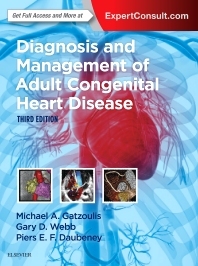 Congenital defects are illustrated with full-color line drawings and by the appropriate imaging modality (for example, EKG, x-ray, echocardiogram, MRI, CT, ). Provides coverage of long-term outcomes, including the management of pregnant patients and patients undergoing non-cardiac surgery.